CrystalClear pHusion - pH Reducer fuses pH lowering qualities with natural electrolytic supplements to safely lower pH levels in pond water at no more than 0.2 points per application. pHusion also adds much needed electrolytes to help pond fish maintain a strong slime coat and healthy appearance. Drastic changes in pH may cause algae blooms, fish and plant stress and possibly death. 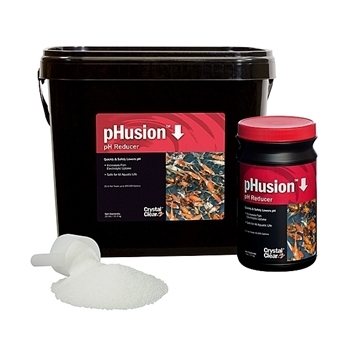 Safe pH ranges for pond fish and plants is 6.5 – 8.0. pHusion reacts with water to form a weak acid. Do not mix product with other chemicals.